AEON Chubu is comprised of 54 branch schools and one head school located in Japan’s beautiful and historic central region. The Chubu Head Office and Head School is located in the heart of downtown Nagoya, the region’s largest city. The climate of central Japan is temperate throughout most of the year, though somewhat hot and humid in the summer. The northern-most area along the Japan Sea is cooler, and receives the most snowfall. These conditions allow for a great deal of outdoor activities. The Tokaido train line winds its way along the Pacific coast, and is the very same route so beautifully rendered in the famous woodblock prints of Hokusai and Hiroshige. The iconic silhouette of Mt. 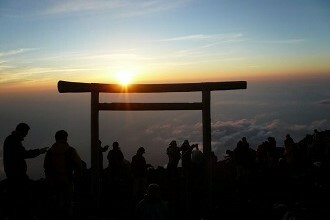 Fuji can be seen from miles away and presents a popular summertime adventure for AEON teachers looking to experience the awe inspiring beauty of watching the sunrise from the summit. Nature lovers can enjoy beautiful views of Mt. Fuji while hiking around the five lakes that surround it. Campers and hikers will also find much to enjoy in Mie and Gifu Prefectures which have a more rural feel than the more metropolitan Aichi Prefecture. With most AEON schools located in Nagoya, or conveniently close to large train stations, teachers are able to enjoy living in and around the region’s many fascinating offerings. From fast-paced urban settings, to bucolic countryside, and everything in between, central Japan is truly the region that has something for everyone. AEON schools in the Chubu Region serve students from a variety of different backgrounds and a wide range of ages. As one of Japan’s most important economic and industrial centers, the region is also home to many of the country’s largest companies, including the world’s top producer of automobiles, Toyota Motor Company. AEON students in the region study English to be competitive in international business, as well as for diverse reasons like conducting research abroad, preparing for university entrance exams or even taking part in multi-national sporting events. 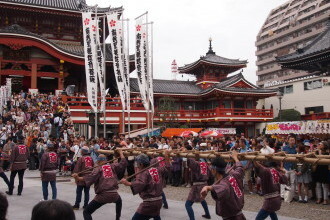 Like many areas in Japan, the Chubu Region is rich in both history and culture. It is the home of famous Edo era landmarks such as Inuyama Castle, Japan’s oldest original castle, and Nagoya castle, the area’s biggest. 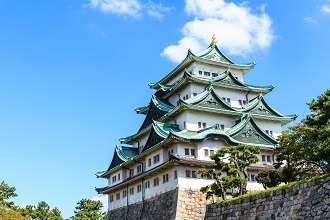 Nagoya Castle is also home to a spectacular cherry blossom festival, where visitors can enjoy the beauty of the Japanese spring and traditional Japanese stage performances. In Gifu Prefecture, sections of Takayama City and Shirakawa City have been preserved to look much as they did hundreds of years ago, making them a draw for Japanese and foreign tourists alike. Kanazawa City, in Ishikawa Prefecture has one of Japan’s most beautiful gardens, Kenroku-en, which is a must see in any season. While in Kanazawa, visitors can also marvel at the many cunning traps and clever architectural features of the so-called Ninja Temple, Myoryu-ji. Due to its large number of universities and cultural institutions Nagoya also offers an interesting array of contemporary wonders. Nagoya City Science Museum’s planetarium is the world’s largest. Fans of pop culture can find a great deal of interest in the Osu Shopping Arcade where there are a number of shops selling games and manga, as well as the uniquely Japanese experience that is Maid Cafes. The city also hosts the World Cosplay Summit where participants from as many as 20 different countries show off intricate costumes based on popular characters from animation, comics, and video games. For lovers of Japanese cuisine, the region’s many local restaurants and Japanese pubs, known as izakaya, serve up delicious local specialties that do not disappoint. In Aichi Prefecture, chicken wings are king, while other dishes such as miso-katsu, a breaded pork cutlet slathered in the prefecture’s unique red-miso sauce, are not to be missed. Toyama Prefecture boasts delicious seafood such as locally fished trout, yellow tail, and firefly squid. Shizuoka Prefecture is the producer of around 40% of the country’s green tea and there are many tea shops, some of which having their own tea houses that offer traditional tea ceremony lessons. With its diverse mix the traditional and the modern, the Chubu Region is a perfect place for someone who is looking to experience Japan at all levels. Click for more information about certain school locations in the Chubu region and comments from our teachers.